The use of real figures in fiction, and particularly crime fiction, usually goes one of two ways. Philip Kerr has enjoyed tremendous success with his Bernie Gunther novels set in and around Nazi Germany and tying in all manner of historical figures, but his earlier Dark Matter – utilising Isaac Newton as a detective – was less successful. And at least Kerr has the freedom of those real people being long departed (conspiracy theories aside) and so largely free to do with as he pleased. 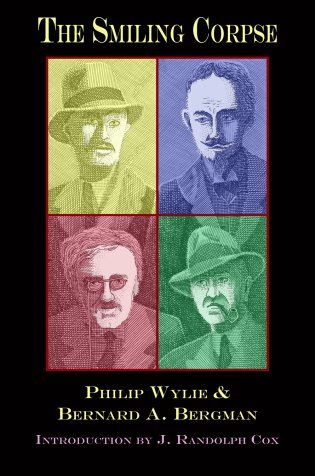 When Philip Wylie and Bernard A. Bergman originally published The Smiling Corpse, the four very real detective writers at its centre (plus sundry background artists) were still very much alive, so one can understand their caution in wanting to keep their names of the final manuscript. Imagine a novel published today in which Lee Child, Michael Connelly, Patricia Cornwell and one of James Patterson’s co-writers solved a crime and you get some idea of what we’re talking about. A party, a murder, a police investigation and four amateur sleuths; that’s really all you need to know. We also, of course, have a Watson – here it’s (fictional) film star John Ballantine – who follows each ‘detective’ around and relays their adventures in duly-impressed fashion. G.K. Chesteron cogitates in a manner not unlike Father Brown, Dashiell Hammett undergoes a Continental Op-style investigation for the bulk of the book’s brief duration, Willard Huntington Wright is given Philo Vance’s affectations and Sax Rohmer sees everything overlaid with sinister Oriental implications in the three chapters he’s given. Each will be dragged into their own particular obsession before the case is done, with Ballantine complicit in more than a few bawdy adventures. Present were a hundred people, most of them writers, professionally temperamental, superficially cocksure, with a long record of voluntary departures to idiotic spots around Santa Fe and Cannes, as well as an average of one and three-fourths divorce per capita, to prove that they were hard to get along with. The mystery is…well. I’m keen to avoid spoilers, but I would say that it’s not fairly clued at all and so doesn’t really count as a novel of detection; of the clues there are, a key one is withheld and even the unveiling of that at the finish wouldn’t really help. Overall, and without wishing to give too much away, it comes in somewhere between Leo Bruce’s (more successful) first two novels and Marion Mainwaring’s (possibly more successful) Murder in Pastiche. It was probably a lot funnier in the 1930s as well, but I recommend it if you have an eye or a general love for that era. As a take on 1930s society it’s probably very good indeed, and it throws some lovely sucker-punches at the hardboiled P.I., but that’s the most I can say about it. Final verdict: fast-paced and good fun, but inessential. ← #2: What’s in a name?